Yep, the wire on my foot broke, too! My machine is a Sapphire 835 viking Husqvarna. 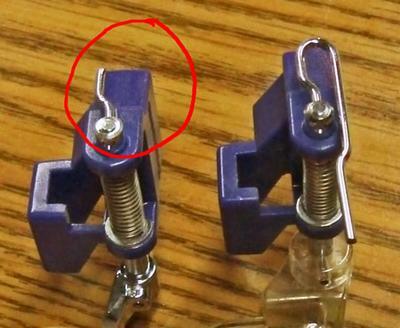 I have now broken two of the spring action free motion quilting feet. They have both broken in the same place, the first angle from the end of the wire that is pointing towards you as you sew. This angle gets a lot of pressure from the place that it sits on the sewing machine. I would double check that the foot is correctly installed...that the wire is riding on top of the needle screw. Usually when it's incorrectly installed you'll hear it, it sounds like the machine is 'chomping' on the foot. If you've gone through two of them, but I'm pretty sure you've done it right all along. What I think is happening is that the foot just plain wears out after a certain length of time. I think that wire is pretty lame, it should be a more substantial piece. The only thing you can do is write to Viking and let them know that you don't like it. Let your dealer know that you don't like it. That's what I did, too. If they never hear of their customers' dissatisfaction, they can't fix it. Will they make a better foot? I don't know. I hope they do. In the meantime, I keep a spare on hand because I know that at some point, the free motion foot I'm using is going to break. As an aside, I'm on my third walking foot...at over $75 a pop, I really didn't like having to replace that one. (And I complained about it to the company, too.) Now, I usually do my stitch in the ditch with my free motion foot. It's cheaper to replace. Do keep you presser feet receipts. If they break in less than a year you might be able to get the dealer to replace the foot with your proof of purchase. I wish I had something better to report...but it's not you...it's the foot. Readers, what do you think? Have you had to replace your free motion foot because it broke or wore out? Let us know using the 'comment' link below. Thank you! In the nearly 20 years that I've had my Husquvarna Viking sewing machine and the walking foot, I've never had a problem with it. As for the free motion foot, or hopping foot, I've broken the top wire on two of them during this time. I do a considerable bit of quilting so I'm not going to complain, but I wish someone would make that top wire a bit stronger. As for quilting with a non-hopping foot, I find that I am unable to maneuver the quilt under the needle and it ends up being a mess. From the Editor: Thanks for sharing! I'm glad to know I'm not the only one that uses up quilting feet. I agree. How much could it possibly cost for a wire that is a little more sturdy! I, too, have had 2 spring loaded quilting feet break. I am on my 3rd one as well. But I got so that I didn't like it because it is so loud when I quilt so I switched back to the regular floating foot. My Sapphire 960Q has two settings and I have been having a terrible time with skipped stitches on the floating foot setting. I have had my machine in the shop multiple times to fix this issue but it was never resolved. I finally figured out that if I set the machine to the spring loaded setting, but continue to quilt with the clear floating foot, I get beautiful stitches. I would recommend using the clear floating foot rather than the spring loaded one. From the Editor: We must be twin-sisters of different mothers! I bolded your solution above so that those who may skim the comments can find their solution easier. how necessary is this piece? Can the spring action free motion quilting foot continue to be used even without the wire? How necessary is that piece? Apparently it is just in the way... I broke mine today and I'm wondering if I can continue using it anyway? From the Editor: Not being able to see it in action, I can't give a definitive answer. The best thing to do is test it on a sample sandwich. If there's a problem, you'll be able to find it there without have to rip anything out. Mine second one broke with first day! My foot broke and got it replaced. Used it for the first time and the new one broke!!! Frustrating!!! And expensive!! I feel your pain. Those darn feet get expensive...both when the break AND when they wear out! I broke my free motion foot, and gave myself a hard time thinking I must have done something wrong. I'm relieved to hear it's a common problem. I wish they would build better quality feet. From the Editor: I'm with you on that, Martha Jay. Those little things are wickedly expensive! Well am I ticked off why don't Husquvarna do something about this piece of rubbish that we all have paid good money for.? Mine did not last even to finish half a quilt. Very disappointed with the crap we get sold today. Viking makes 2 types of free motion quilting feet, floating and hopping (with a spring). Try using one of the clear plastic floating feet. Many quilters prefer a non-hopping foot. Leah Day, an on-line FMQ instructor even gives instructions on how to intentionally "break" a spring action foot so it doesn't hop. http://leahday.com/pages/break-your-darning-foot. Those of you with broken wires are half-way there per Leah Day's instructions. Mine broke too. Did you notice problems with the stitching or breaking threads after the wire broke? Yup, this seems to be a common problem ! I have now tried three different makes of free motion / quilting / darning foot.. The last one broke yesterday after 5 months of usage - same each time, its the top pin that snaps. If anyone has found a free motion foot with a stronger 'pin' please post !! Well I feel for all of you! My free motion foot broke in the first 6 months and my second walking foot just broke this weekend! That is two walking feet in less than 1 year! I am rather ticked and disappointed at the quality of the feet! Foot wire broke off the first day…. This is a sad reflection on my new Viking! I had the exact same problem, and I only used it for 2 small lap quilts when it broke, so it was not from overuse, and it was installed correctly. I continued using the broken foot for the rest of the quilt and although I had to work a little harder to move the fabric, it looked just fine and I was able to finish the project. I think Viking makes fairly good products, but this quilting foot is crap. I've used my walking foot 3 times and I sure hope it holds up better than the free motion quilting foot! From the Editor: I totally agree with you based on my own experience. My foot broke in same place--the wire. I took it to the dealer and they said, "Oh my, I have never seen or heard of this before." They also had none in stock they hope to get an order in soon I will buy two this time. I had no idea this foot could break, it is only 7 months old. This is my first Viking. I used to sew and quilt on a Singer I never broke a foot and I used it for years. I have gone through 4 or 5 in the the last 3 months and one month machine was in being checked out to see if something was wrong. Brought it home and done one quilt and started next quilt and it broke again. Wire broke in the same exact spot as yours did on the free motion spring foot, and I know its installed correctly. Same thing happened to me, the wire broke and I only had it 2 months. The wires broke off mine the first time I used it. I have no idea how old this question is, but wanted to add: I have a 30 yr old Viking and I broke my foot too, but I think for this machine it's called a darning foot. You guessed it, the part that broke was wire. So, since I didn't want to stop sewing, I tried fmq with just a clear open toe foot. That was 8 months ago - it works just fine. As long as it does. I don't plan to replace it. I lower the feed dogs, put the dial that controls the foot pressure to 'darn' and quilt away! My Spring Foot for my Sapphire 875Q also broke. I just got a replacement for a Christmas gift. At $41.00, it's not an inexpensive replacement. My foot broke 3 times now! My free motion quilting foot has now broken 3 times the last time within 5 days! I was told they had a lifetime warrenty on breakage and now they say "no". I will call the customer service number for Viking to report this problem, I hope others will also do this so they will fix the problem.